I often wonder if lamps were around centuries ago would we have marble lamps carved by Michelangelo. It is an original medium, and whenever I see a carved marble lamp I instantly think it's a piece of art. Of coarse art is relative and not what this blog was designed to discuss so.... let's get back to business: lamp repair. 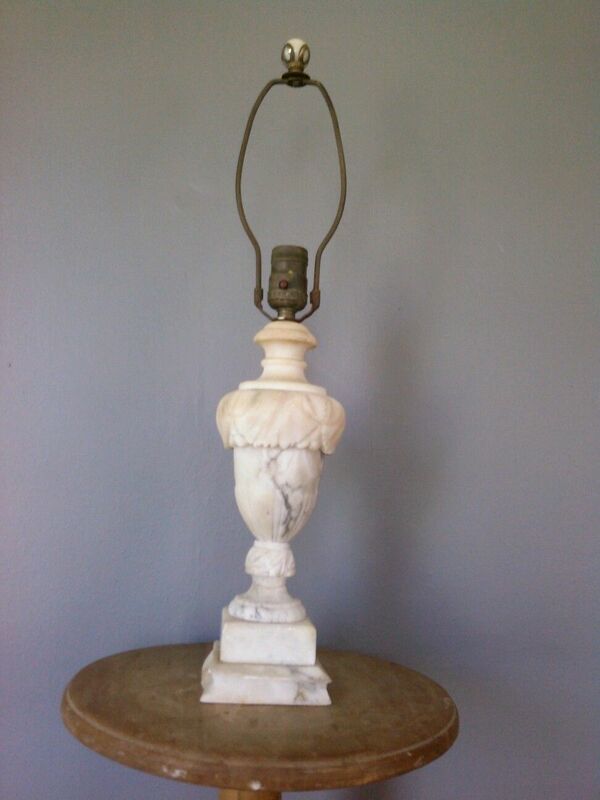 A customer brought in this vintage alabaster marble urn lamp in need of a repair. It didn't have a plug or barely a lamp cord. They said they wanted it renewed so we were going to rewire with a new socket, plug, cord set, harp and harp base. We will reuse any parts worth saving. We begin the checking the lamp for any major defects and making a list of the lamp parts we will need to make the project complete. For this alabaster urn lamp we will need a new lamp cord, antique brass socket, antique brass harp and harp base. We will need to remove the old socket from the lamp. Using a small flat head screwdriver we pry the socket shell from the socket cap. Someone has been here before and removed the old lamp cord from the socket interior. Next, we remove the old socket cap. With no set screw, the old socket cap just unscrews from the lamp's threaded rod. The old threaded rod is a little rusty. It is not worth replacing yet, so we use a wire brush to clean up the threads on the top. Now is a good time to thoroughly clean the lamp body and remove any debris on the lamp. In this case, debris includes some old lamp cord. Now we are ready to start the rewiring. First, we push out new lamp cord from the bottom of the lamp to the top. 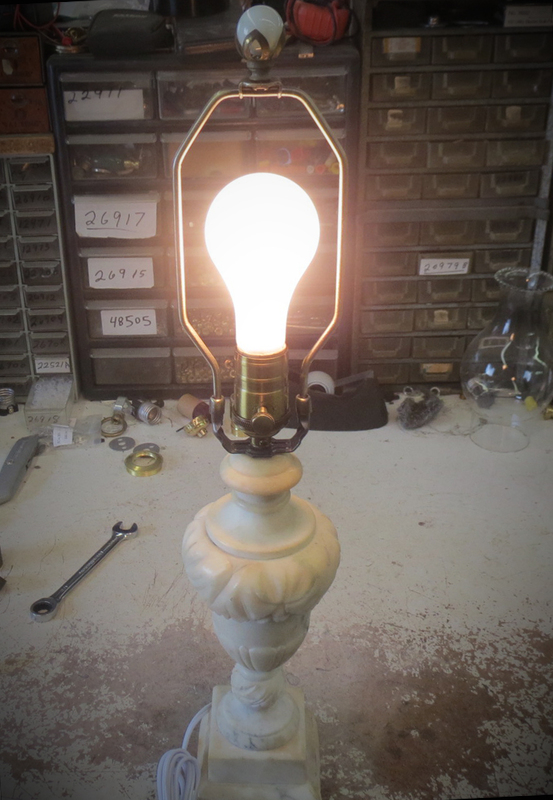 Then, the harp base and the new socket cap go on the lamp. The new socket cap had a retaining ring for the socket shell and a set screw for the threaded rod. If a socket cap does not have a set screw, a lock washer is suggested. Next, we tie a UL knot in the lamp cord and attach the socket interior. The smooth lamp cord connects to the brass screw terminal and the ribbed cord connects to the nickel terminal. The lamp cord slack is pulled back down the lamp body so the socket interior sets on the socket cap. The new socket shell slips over the socket interior and is attached with the retaining ring. Next, we attached the new harp to the harp base. This lamp had an old finial on the old harp so we will simply unscrew it from the old harp, and screw on the new harp without any problem. Note: Lamp harps have standard tops threaded 1/4-27. Most finials have the same thread pattern so you can easily remove a finial from one harp to another. Harps are installed by lifting the locks up the harp and squeezing the tines to fit in the harp base. They should fit snug but flush with the harp base. If the harp is not seating correctly, try adjusting the harp base with some pliers. The locks should slide all the way down and over the top of the harp base. Finally, we add a bulb and test the lamp.